The results are in!!! This week I asked you, the reader, which recipe you would like to see posted on the blog next. You voted on twitter ( @KitchenGoddess3 ) and on the Facebook Page and decided that you wanted to see my Traffic Light Fajitas, so here they are! These Traffic Light Fajitas are so called because strips of red, yellow and green make up the bulk of the filling. The bold, vibrant colours remind you of fiery hot Mexico and the beaming hot sun. What a better way to celebrate the start of the hot weather than with this fun dish. 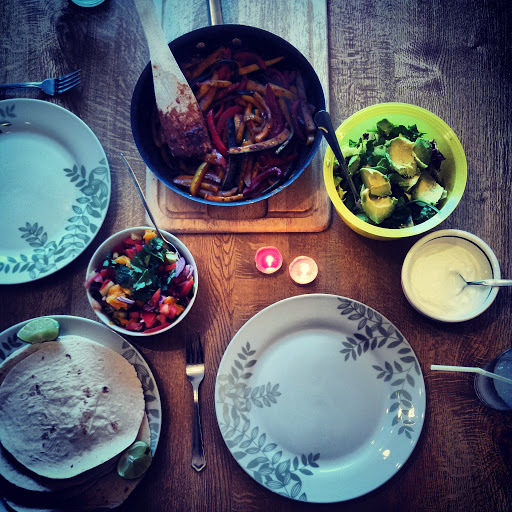 We often have “Mexican Night” in our house and although we eat our fair share of enchiladas, burritos and tacos, fajitas are the firm favourite. Fajitas can be filled with almost anything. Chicken, beef and pork work really well but for the vegetarians among us (or meat eaters who just fancy a change) mixed peppers are the stars of the dish. Their ability to soften under the fiery heat of the pan yet retain their shape and a slight bite gives them the perfect texture when wrapped in a soft corn tortilla. Courgettes may not initially an obvious choice. Often used in ragouts and slow cooked dishes where they are given the chance to soften and break down, they might not seem suitable for fajitas. However, by cutting the courgette into strips and cooking it hard and fast on a high heat you are able to retain the same kind of bite you get in the peppers. I find the prep when making fajitas quite therapeutic. I think it’s the repetition of cutting neat, clean strips all of the same length and width. Or maybe it’s the fact that it’s normally carried out with a margarita in hand!!! But it’s all part of the fun. Fajitas are all about everyone chipping in and sharing and what better way than with a jug of margaritas right?! So we’ve got the perfect red, yellow and green combination for our Traffic Light Fajitas but that’s only half of the battle. The sweet flavour of the veg needs to be kicked up a notch with a fiery blend of spices. I first made my own spice blend when I had friends round in a “Come Dine with me Style” competition at university. Since then, Mr KG has refined it and we now have our house blend. It’s worth noting that everyone has different tastes so as you go do have a taste – some like it hot, some like it peppery. It’s up to you! As much as you can customise what condiments go into a fajita you can also customise the spice. Our spice mix is as smokey as it is hot, but it’s not a pure chilli heat. The cayenne gives it a peppery kick too for a more well rounded flavour! Add your own condiments – salsa, sour cream, guacamole. Heat a little oil in a frying pan until it’s really hot. 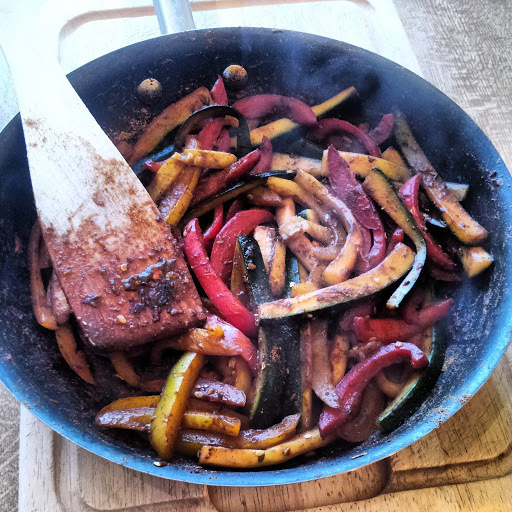 Fry the peppers in the pan on a high heat until the edges begin to soften, a little charring on the skin is also good! Cook the peppers for 5 mins until they have softened through and add the garlic. Fry for a further 2 minutes before adding the sliced courgettes to the pan. Fry for a further 5 mins, giving the courgette a chance to heat through. Add the spices to the pan and fry for a further 2-5mins. (Add a little water if the vegetables are beginning to stick but aren’t yet cooked through). Once all of the vegetables have softened but before they completely lose their shape serve in corn tortillas with your choice of condiment. 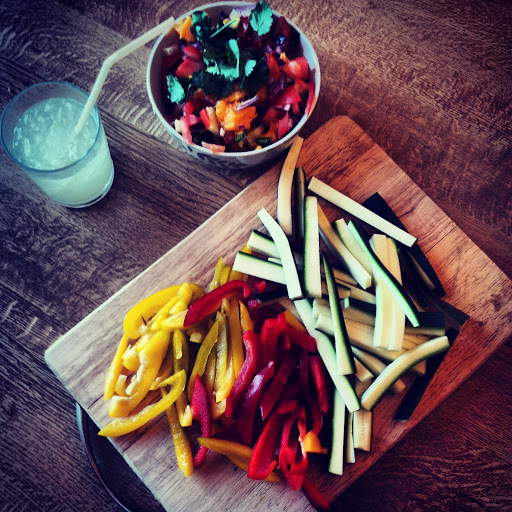 Why not serve these fajitas and I shared one of my favourite salsas – Mango and Avocado Salsa. But you could equally add sour cream, guacamole, salad and even some cheese. The beauty with these fajitas (like the origins of this post) it’s for YOU to decide!